Sodium currents are an important transmembrane current and responsible for the formation of action potential duration in a variety of cells such as cardiomocytes, neurons, and vascular smooth muscle cells. [1-3]. The structural or functional alteration of sodium channel has been showed to trigger or aggravate the arrhythmias and other heart diseases, such as LQT syndrome and Brugada syndrome [3-7]. Though lots of studies revealed the important roles of sodium currents in human and animals cardiomocytes, the information about the developmental changes of sodium currents in postnatal human hearts was limited [8-9]. During the past decades, the relatively large body of data has documented that there are significant developmental changes in the density and characteristics of calcium currents and potassium currents observed in mammalian cardiac tissues [10-15]. For instance, it was reported that transient outward potassium currents both in atrial and ventricular cardiomocytes underwent a progressive increase in postnatal mouse . Calcium currents are also observed much larger in adult hearts than pediatric hearts . Likewise, the mRNA expression and the channel kinetics of sodium channel also display the age-relevant changes in mouse and canine hearts [17-18]. Especially recently, a large-scale analysis of gene expression of cardiac ionic channels showed that SCN5A expression was remarkably increased during postnatal development in mouse . However, whether sodium currents also undergo the developmental increase from pediatric to adult hearts remain unknown. The present study was carried out to investigate the difference of sodium currents between pediatric and adult hearts, which will help to provide the evidence that sodium channels underwent postnatal development in human atria just like other currents. Atrial samples were obtained from human right atrial appendage of six adult patients with rheumatic heart diseases (42.5±1.3 years old) undergoing cardiopulmonary bypass, and five pediatric patients with congenital heart diseases (3.4±1.2 years old) undergoing cardiopulmonary bypass. All the experimental procedures were approved by the ethics committee of Harbin Medical University, with informed consent of these patients, and performed in accordance with the principles outlined in the Declaration of Helsinki. All the patients were in normal sinus rhythm with no record of atrial arrhythmias. Human atrial specimens were immediately placed in KB solution gassed with oxygen (95% O2, 5% CO2) at 4°C from surgical excision. The method to isolate human atrial myocytes is just as described previously with some modifications . In brief, atrial samples were cut into chunks and washed three times in oxygenated Ca2+ free Tyrode's solution at 37°C, and then was incubated in 10 mL Ca2+ free Tyrode's solution containing collagenase type II and BSA for 40 min at 37°C. Following, the tissues were transferred to fresh 10 mL Ca2+-free Tyrode's solution containing collagenase type II. The isolation was finished when microscopic examination revealed a satisfactory number of intact cardiomyocytes. Human atrial myocytes were collected and resuspended in KB solution and then kept at 4°C before they were used. The KB solution contained (in mM) glutamic acid 70, taurine 15, KCl 30, KH2PO4 10, HEPES 10, MgCl2 0.5, glucose 10, and EGTA 0.5 (pH adjusted to 7.4 by KOH). The Tyrode's solution contained (in mM) NaCl 136, KCl 5.4, CaCl2 1.8, MgCl2 1.0, NaH2PO4 0.33, HEPES 10, and glucose 10 (pH adjusted to 7.4 with NaOH). The external solution for recording sodium currents contained (in mM) CsCl 120, NaCl 25, HEPES 5, MgCl2 1.0, CaCl2 1.0, and Glucose10 (pH adjusted to 7.4 with CsOH). The internal solution for sodium currents recordings contained (in mM) CsCl 20, CsF 110, NaCl 5, HEPES 5, EGTA 10, and MgATP 5 (pH adjusted to 7.2 with CsOH). For all recordings, calcium channel blocker verapamil 10 μM was included in the external solution to minimize contamination of calcium currents. A small drop of KB solution containing isolated human atrial cardiomyocytes was placed in a 1-mL chamber mounted on the stage of an inverted microscope. After human atrial cells adhered to the bottom of the chamber, the external solution for recording sodium currents was used to continuously superfuse these cells. Only rod-shaped atrial myocytes with clear cross-striation were selected for current recording in the present study. The whole-cell patch-clamp techniques were used to record sodium currents in the voltage-clamp mode by an Axopatch 200B amplifier (Axon Instruments). When filled with pipette solution the electrodes had tip resistances from 2 to 4 MΩ. The potential of the pipette was zeroed before contacting the cell membrane in the bath solution. Voltage command pulses were generated by a 12-bit digital-to-analog converter controlled by pClamp 9.0 software (Axon Instruments). After a gigaohm seal formation, the membrane was ruptured to form the whole-cell configuration. The capacitance and series resistance were compensated and sodium currents data were expressed as current density (pA/pF) by normalizing the current to its capacitance for each atrial myocytes. Sodium currents (INa) were recorded at room temperature (18 ± 1oC). All the data are presented as mean±SEM. Statistical analysis was performed by ANOVA and the student t-test. Boltzmann function was used to fit the voltage-dependent activation and inactivation curve of sodium currents. The mono-exponential function was used to determine the recovery time constants of sodium currents from inactivation. A two-tailed value of P<0.05 was taken to indicate statistical significance. Sodium currents were elicited by a series of 100-ms depolarizing test potentials between -60 mV to +40 mV with 10 mV step at a holding potential of -80 mV. The average capacitance was 49.6±3.1 pF in pediatric atrial myocytes, and 71.0±5.7 pF in adult atrial myocytes. Fig. 1A showed typical superimposed traces of sodium currents recorded in pediatrics and adults atrial cells. The peak density of sodium currents at -30 mV was significantly larger in adults atrial cells (-46.67±2.36 pA/pF, n=13) than pediatrics atrial cells (-31.82±1.91 pA/pF, n=10) (P<0.05). Fig. 1B demonstrated the I-V relationship curve of sodium currents recorded in pediatric and adult atrial myocytes. There was a significant difference of the peak amplitude of sodium currents between two kinds of atrial cells (n=13 and 10, respectively, P<0.05). However, the maximum activation voltage for peak sodium currents in adult atrial cells did not obviously differ from pediatric atrial myocytes. Fig. 2 displayed the time-dependent kinetic properties of sodium currents in two kinds of atrial cells. In order to calculate the time constants for activation (τact) and inactivation (τinact), a single exponential function was used to fit the descending phase of sodium currents traces, and a bi-exponential function to fit the rising phase of sodium currents traces, respectively. Fig. 2B and 2C showed the comparison of τact and τinact of sodium currents between pediatric and adult atrial cells. The activation and inactivation constants were remarkably smaller in adult atrial cells, compared with pediatric cells. At -30 mV, the τact was 1.01±0.17 ms in adult atrial cells and 1.79±0.15 ms in pediatric atrial cells (n=13 and 10, respectively, P<0.05). Similarly, the τinact.f (the fast component of inactivation) and τinact.s (the slow component of inactivation) were 1.33±0.23 ms and 5.69±0.50 ms for adult atrial cardiomyocytes and 2.33±0.34 ms and 7.93±0.68 ms for pediatric atrial cells, respectively (n=13 and 10, respectively, P<0.05). Representative traces of sodium currents recorded in adult and pediatric atrial cells. (A) Sodium currents was elicited by 100-ms test pulses in 10 mV increments from a holding potential of -80 mV to potentials between -60 and +40 mV. The I-V relationship curve of sodium currents recorded in pediatric and adult atrial cells (n=10 and 13, respectively) (B). The amplitudes of sodium currents were normalized to cell capacitance and presented as mean values at different test potentials. * represents P<0.05. The time-dependent properties of sodium currents recorded in adult and pediatric atrial myocytes. The single exponential function was used to fit the descending of sodium currents traces. The bi-exponential function was used to fit the ascending phase of sodium currents traces (A). Comparison of the activation (B) and inactivation (C, D) time constants of sodium currents between adult and pediatric atrial myocytes (n=13 and 10, respectively). * means P<0.05. The voltage-dependent activation of sodium currents were recorded by using a 50 ms prepulse of -100 mV followed by a series of 100 ms test pulses between -70 and +30 mV. The V1/2 (the voltage at half activation) values were -38.63±0.32 mV in adult atrial myocytes and -37.01±1.18 mV in pediatric atrial myocytes (n=10 and 9, respectively, P>0.05) (Fig. 3A). Furthermore, the slope factors (k) were 5.07±0.28 in adults and 7.51±1.01 mV in pediatrics, (n=10 and 9, respectively, P>0.05). This implies that there is no significant difference of voltage-dependent activation of sodium currents. The voltage-dependent inactivation properties were determined using a two-step protocol as shown in Fig. 3B. Compared with adult atrial cells, the inactivation curve of sodium currents in adult atrial cells shifted toward positive potential (Fig. 3B). The V1/2 values were -60.00±0.99 mV in adult atrial myocytes and -71.68±0.62 mV in pediatric atrial myocytes (n=10 and 9, respectively, P<0.05). It suggests that cardiac sodium channel is more easily inactivated by voltage stimuli in pediatric than adult atrial cells. The slope factor of the voltage-dependent steady-state inactivation curve of sodium currents was 6.15±0.76 mV in adult atrial myocytes and 5.53±0.39 mV in pediatric atrial myocytes, respectively (n=10 and 9, respectively, P>0.05). Fig. 3C illustrated the time-dependent recovery curve of sodium currents from inactivation using a paired-pulse protocol. There was a significant difference of recovery time constants of sodium currents between adult and pediatric atrial myocytes (τ=13.39±1.57 and 8.91±0.79 ms, n=10 and 9, respectively, P<0.05), which indicates that the recovery process of sodium channel from inactivation is much faster in pediatric than adult cardiomocytes. The voltage-dependent kinetics of sodium currents recorded in adult and pediatric atrial myocytes. 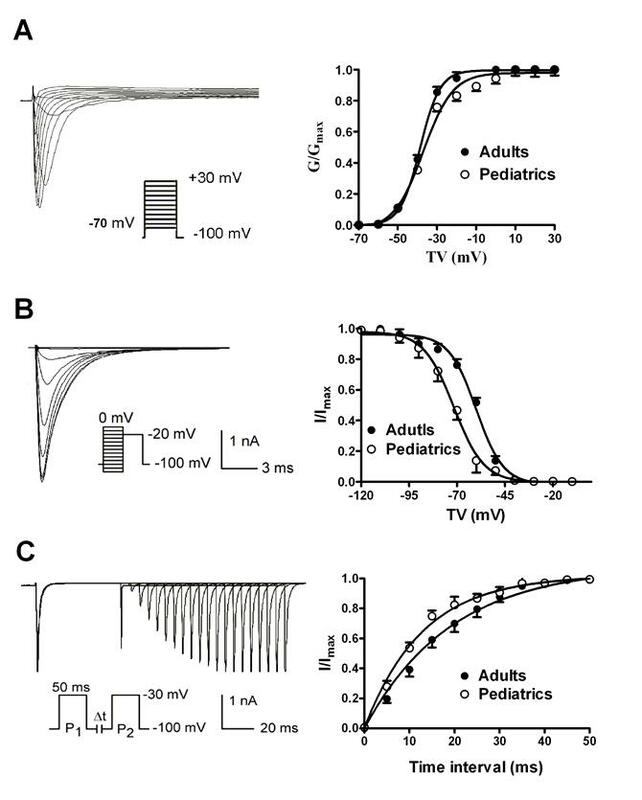 The voltage-dependent activation (A) and inactivation (B) of sodium currents recorded in atrial cells isolated from pediatric and adult patients (n=9 and 10, respectively). The time-dependent recovery of sodium currents (C) from inactivation was studied using paired-pulse protocols. The main findings of the present study were that there were significant differences of sodium current properties between pediatric and adult atrial myocytes, which firstly provided the evidence for the postnatal development of sodium currents in human atrial cells. Sodium currents play a key role in the initiation and rapid repolarization of action potential duration in many types of cells [1-3]. Cardiac sodium channels are mainly composed of pore-forming α-subunit such as Nav1.5 (SCN5A) and auxiliary β-subunits [8, 19-20]. The abnormalities of cardiac sodium channel subunits provide the pathological substrate for severe Long QT syndrome, fetal ventricular arrhythmias or atrial arrhythmias [3-7, 20-21]. In a previous study, we compared the characteristic of sodium currents between right atrial appendage and atrial septum of the same heart, and found smaller sodium currents in right atrial appendage compared with atrial septum, which allowed for faster conduction in these cells than right atrial appendage . In summary, a lot of studies have revealed that sodium currents are very important for the physiological functions of human and animals' hearts, but whether sodium currents undergo the developmental changes in postnatal human hearts is completely unknown. It is well known that potassium currents played an important role in the regulation of cardiac electrophysiological properties and the pathogenesis of heart diseases [22-23]. Notably, it was found that there are obviously developmental changes of potassium channels currents in animal hearts [13-15, 24]. Wang et al uncovered that adult atrial cells exhibited a larger current density and faster recovery decoy of transient outward potassium currents compared with neonatal atrial myocytes, which provided the evidence for developmental changes of potassium currents in human atrium . The upregulation of Kv4.2 and Kv4.3 mRNAs were shown to contribute to thyroid hormone-induced the development of transient outward potassium currents in rat ventricle . Inward rectifier potassium currents and ATP-sensitive potassium currents also displayed a development increase from gestation day 10 to neonatal day 30 . The inactivation process of calcium currents in pediatric human atria cells was approximately 2-fold faster than adults, which suggested there were age-relevant changes in calcium currents inactivation . Sodium channel encoding genes including Nav1.5 were more expressed in adult hearts than immature hearts . These developmental changes in sodium channel subunits may contribute to changes in macroscopic sodium currents during development . Recently, a large-scale analysis of gene expression of ion channels showed that SCN5A expression was increased during postnatal development in the mouse heart . However, whether sodium channels also undergo the developmental increase between pediatric and adult hearts remain unknown. In the present study, we found that sodium currents were larger in adult atrial myocytes than pediatric atrial myocytes. This finding was in accordance with the increase of sodium channel mRNA in the development of mouse heart , indicating the developmental changes of sodium currents. We further investigated the difference of time constants of sodium currents between two types of atrial cells and found that the activation and inactivation time constants in adult atrial cells were smaller than that in pediatric atrial cells. It indicates that sodium channel is closed more slowly in pediatric atrial myocytes than adults, and the number of sodium ion flowing into cytoplasm through single sodium channel tend to be larger in pediatric atrial cells than adults at the late stage of channel inactivation, which is likely to cause the delay of membrane early repolarization and the prolongation of action potential duration. 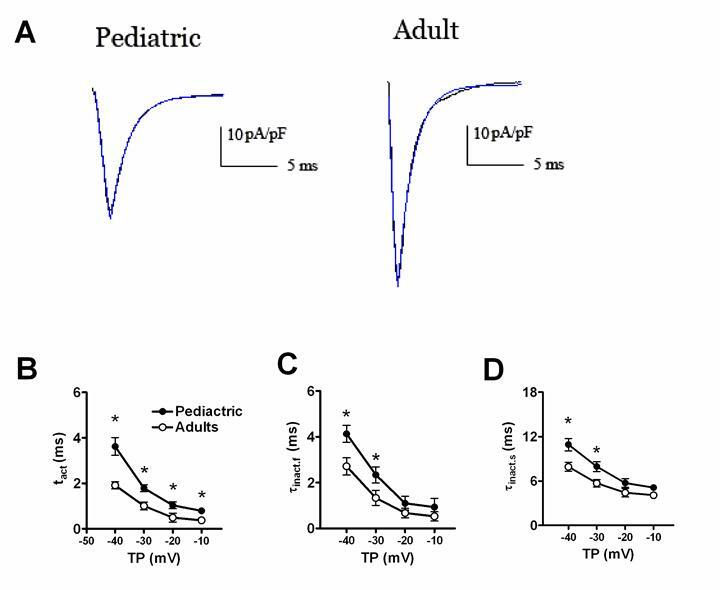 Consistently, it was previously reported that action potential duration was significant longer in infant atrial cells than adults during the early period of membrane potential repolarization [24, 26]. Similarly, the difference of voltage-dependent activation and inactivation of sodium channels were studied and adult atrial cells exhibited the similar voltage-dependent activation and more slow voltage-dependent inactivation compared with pediatric atrial cells. The delay of the voltage-dependant inactivation will cause much long opening time for sodium channel in hearts, which might contribute to the increase of sodium currents. Furthermore, the faster recovery process of sodium channel from inactivation in pediatric atrial cells than adults would promote sodium channels more frequently opened in a certain period of time and partially provided a rational explanation for the faster heart beating in pediatrics. Taken together, adult atrial myocytes exhibited significantly different characteristics of sodium currents from pediatrics, including a larger current density, and slower inactivation and recovery. These findings provide the experimental evidence for the postnatal development of sodium currents in human atrial cells. This work was supported by the Special Postdoctoral Scientific Funds of China (201003461), the National Natural Science Fund of China (30900601/30971252) and the Dr. Wu Lien-Teh (Wu Lian-De) Youth Foundation of Harbin Medical University.